Even though I'm still gnome-shell impaired (waiting on 3D support landing for my Radeon video card), I helped out Giovanni Campagna into getting Bluetooth support in the gnome-shell. My work was to review Giovanni's code for gnome-bluetooth, and making sure that the gnome-shell behaviour matched that of the existing GNOME Bluetooth applet. 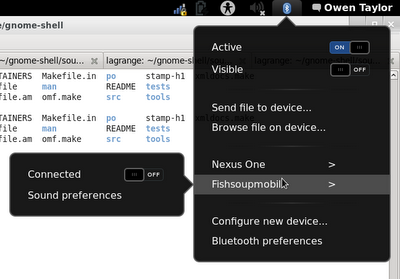 A lot of to-and-fro, but the gnome-bluetooth changes are now in, and waiting on sub-menu fixes for gnome-shell itself. Owen was kind enough to provide me with a screenshot for your enjoyment. This wasn't my first interaction with Giovanni, as, in another long-winded bug, we hashed out the volume control shell icon. This work is already merged, and lives in gnome-shell. As Anonymous noted, Active On/Off is pretty bad wording choice. Use either State On/Off or Bluetooth On/Off. Please don't use a '>' for the arrow, type crime! Also, use title capitalization for the menu item text. hadess, gnome-bluetooth and its dependencies, gnome-shell, pulseaudio-module-bluetooth and bluez seem to be giving me a strange problem. - i once unistalled gnome-bluetooth and it removed gnome-shell, it listed but my fault i didn't see, so on restart, gnome would fail to load, Luckily I logged in through kde and resintalled gnome-shell in the console there.